Ergoline derivatives comprise a diverse group of chemical compounds whose structural skeleton is the alkaloid ergoline. Ergoline derivatives are used clinically for the purpose of vasoconstriction (5-HT1 receptor agonists—ergotamine) and in the treatment and alleviation of migraines (used with caffeine) and Parkinson's disease. Some ergoline alkaloids found in ergot fungi are implicated in the condition ergotism, which causes convulsive and gangrenous symptoms. Others are psychedelic substances, including LSD and some alkaloids in Argyreia nervosa, Ipomoea tricolor and related species. 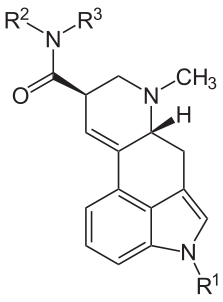 In addition to the naturally occurring ergonovine (used as an oxytocic) and ergotamine (a vasoconstrictor used to control migraine), synthetic derivatives of importance are the oxytocic methergine, the anti-migraine drugs dihydroergotamine and methysergide, hydergine (a mixture of dihydroergotoxine mesylates, INN: ergoline mesylates), and bromocriptine, used for numerous purposes including treatment of Parkinson's disease. Newer synthetic ergolines used for Parkinson's disease include pergolide and lisuride. Perhaps the most famous ergoline derivative is the psychedelic drug LSD. Ergometrine and ergotamine are included as schedule I precursors in the United Nations Convention Against Illicit Traffic in Narcotic Drugs and Psychotropic Substances. Ergolines can pass into breast milk and should not be used during breastfeeding. They are uterine contractors that can increase the risk of miscarriage during pregnancy. Ergoline alkaloids are found in lower fungi and some species of flowering plants: the Mexican species Turbina corymbosa and Ipomoea tricolor of the Convolvulaceae (morning glory) family, the seeds of which were identified as the psychedelic plant drugs known as "ololiuhqui" and "tlitliltzin", respectively. 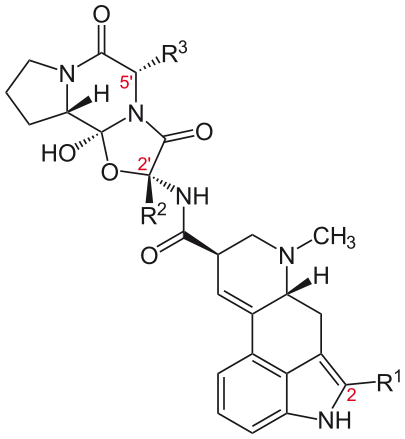 The principal alkaloids in the seeds are ergine and its optical isomer isoergine, with several other lysergic acid derivatives and clavines present in lesser amounts. The Hawaiian species Argyreia nervosa includes similar alkaloids. It is possible, though not proven, that ergine or isoergine are responsible for the psychedelic effects. There may be a fungal origin of the ergoline alkaloids also in the Convolvulaceae. Like the ergot alkaloids in some monocot plants, the ergoline alkaloids found in the plant Ipomoea asarifolia (Convolvulaceae) are produced by a seed-transmitted endophytic clavicipitaceous fungus. Ergoline alkaloids were first isolated from ergot, a fungus that infects grain and causes the disease ergotism. Ergot also has a long history of medicinal use, which led to attempts to characterize its activity chemically. This began in 1906 with the isolation by G. Barger and F. H. Carr of ergotoxine, so-named since it appeared to exhibit more of the toxicity of ergot than its therapeutic qualities. The isolation of ergotamine in 1918 by Arthur Stoll made possible the first therapeutic use of isolated ergoline alkaloids. With the determination of the basic chemical structure of the ergot alkaloids in the early 1930s, an era of intensive exploration of synthetic derivatives began. There are 3 main classes of ergoline derivatives, the water-soluble amides of lysergic acid, the water-insoluble ergopeptines (i.e., ergopeptides), and the clavine group. Peptide ergot alkaloids or ergopeptines (also known as ergopeptides) are ergoline derivatives that contain a tripeptide structure attached to the basic ergoline ring in the same location as the amide group of the lysergic acid derivatives. This structure consists of proline and two other α-amino acids, linked in an unusual cyclol formation >N-C(OH)< with the carboxyl carbon of proline, at the juncture between the two lactam rings. Some of the important ergopeptines are summarized below. In addition to the following ergopeptines, a commonly encountered term is ergotoxine, which refers to a mixture of equal proportions of ergocristine, ergocornine and ergocryptine, the latter being a 2:1 mixture of alpha- and beta-ergocryptine. A variety of modifications to the basic ergoline are seen in nature, for example agroclavine, elymoclavine, lysergol. Those deriving from dimethylergoline are referred to as clavines. Examples of clavines, include festuclavine, fumigaclavine A, fumigaclavine B and fumigaclavine C.
^ Juszczak, GR; Swiergiel, AH (2013). "Recreational use of D-lysergamide from the seeds of Argyreia nervosa, Ipomoea tricolor, Ipomoea violacea, and Ipomoea purpurea in Poland". J Psychoactive Drugs. 45 (1): 79–93. doi:10.1080/02791072.2013.763570. PMID 23662334. ^ http://www.incb.org/pdf/e/list/red.pdf Archived 2008-02-27 at the Wayback Machine. ^ kidsgrowth.org --> Drugs and Other Substances in Breast Milk Archived 2007-06-23 at Archive.today Retrieved on June 19, 2009. ^ a b c Schardl CL, Panaccione DG, Tudzynski P (2006). "Ergot alkaloids – biology and molecular biology". The Alkaloids: Chemistry and Biology. The Alkaloids: Chemistry and Biology. 63: 45–86. doi:10.1016/S1099-4831(06)63002-2. ISBN 978-0-12-469563-4. PMID 17133714. ^ Carod-Artal, FJ (2015). "Hallucinogenic drugs in pre-Columbian Mesoamerican cultures". Neurologia. 30 (1): 42–9. doi:10.1016/j.nrl.2011.07.003. PMID 21893367. ^ Steiner, U; Ahimsa-Müller, MA; Markert, A; Kucht, S; Groß, J; Kauf, N; Kuzma, M; Zych, M; Lamshöft, M; Furmanowa, M; Knoop, V; Drewke, C; Leistner, E (2006). "Molecular characterization of a seed transmitted clavicipitaceous fungus occurring on dicotyledoneous plants (Convolvulaceae)". Planta. 224 (3): 533–44. doi:10.1007/s00425-006-0241-0. PMID 16525783. ^ G. Floss, Heinz (1976). "Biosynthesis of Ergot Alkaloids and Related Compounds". Tetrahedron Report. 32 (14): 873 to 912. doi:10.1016/0040-4020(76)85047-8. This page was last edited on 30 November 2018, at 07:23 (UTC).